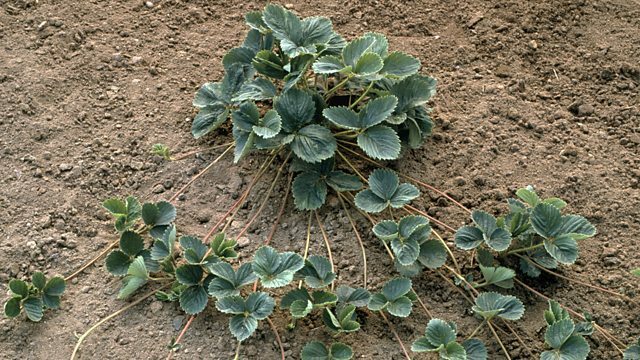 Whether you grow strawberries (Fragraria x ananassa) as perennials in U.S. Department of Agriculture plant hardiness zones 5 through 8, or treat them as cool-season annuals in USDA zones 9 through 10, they eventually need dividing. Dividing strawberry plants doesn't require lifting a mature plant from the soil and splitting it into smaller sections. Instead, you need to separate the many plantlets attached to each mature plant on trailing stems, called runners. Do this in midsummer, so the new plants have enough time after division and transplanting to settle in their new spot before the first fall frost. Like hesitant kindergartners on the first day of school, strawberry plantlets feel much better about taking the first step toward adulthood with a parent's hand to hold. Using their flexible runners as "umbilical cords," it's a simple matter to direct each sprouting node into its own pot of growing medium. Once the roots are firmly anchored in their new home and the plantlet is putting out new growth, division is a snip of the stem cutters away. Fill each of the pots to within 1/2 inch of the rim with organic potting compost. Choose a healthy strawberry plant with several vigorous runners. Snip off all but the four strongest runners with the stem cutters. Each runner should have at least one well-rooted, leafed-out node. Dig holes deep enough to sink the pots up to their rims and close enough to the parent plant for the runners and nodes to reach. Position each node, roots down, on top of the soil in a sunken pot. Bend a twist-tie into an inverted "U"and insert it, legs down, over the node so the roots remain in contact with the potting soil. Water the pots well, and continue watering whenever you water the parent plant. After a month, gently tug on each plantlet; if it doesn't pull loose, it's strong enough for independent living. Simply snip the runner where it connects to the plantlet. Move the potted transplants to their new spot in the garden, which should get at least eight hours of daily sun and loose, well-draining, organically rich soil. If necessary, amend clay soil by working a a 4-inch layer of organic compost into to it before planting. For sandy soil, a 1-inch layer is enough. Dig holes deep enough to contain the plantlets' rootballs, but keep their crowns -- the short, thick stems below the leaves and above the roots -- out of the soil. Firm the soil gently around the plants and water well to eliminate air pockets. Going forward, they'll need a total of 1 inch, of rainfall or supplemental water each week. That's about 6 gallons per 10 square feet of soil.